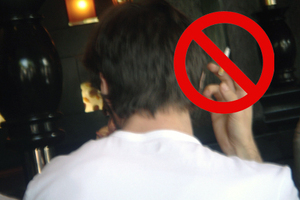 It’s official: there is no smoking allowed in public places including bars, restaurants, cafés, and clubs in France. With all the predicted hysteria and protest, things seemed normal and sober when I went to my local café yesterday. The café still smelled of smoke (I think it will be months until the distinct odor is gone) but no one lit up or even tried. I am not a smoker and will now appreciate my clothes not smelling like a pack of Camel’s, but somehow I feel the corny yet romantic stereotype of a smoky café will disappear along with other French traditions. I thought that the outdoor cafes would reopen en masse to accommodate smokers, but they haven’t and the French seem to be taking it lying down (Oops! I hope they don’t smoke in bed). Now I’m having romantic notions of large, angry protest groups marching down the rue de Rivoli or the Champs Elysees, carrying giant cigarette packs with simulated smoke coming out of them, screaming epithets like “I smoke, therefore I am”” or “No smoking, no life”. Alas, I think my romantic notions will go up in smoke and the French will abide by the new rule, even though they will be grumbling.